BackBeat '64 | A "Musical Memory Tour" of the music of the Beatles! A "Musical Memory Tour" of the music of the Beatles! Rare is it that a local rock band has resumed playing for the past 12 years with original members. Every year the musicianship grows and the music performances become more special. The Beatles defined music like no other band in history. 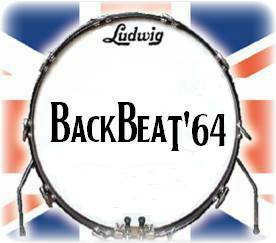 BackBeat ’64 proudly performs these songs with a passion for authentic reproduction. No backing tracks or sampled vocals. Just live vocal harmonies and real instruments. They employ their sound engineer when needing that layered sound that the Beatles trademarked. This is your change to catch the band in action all around Western New York. CLICK HERE or check our Shows page for our upcoming venues. We look forward to seeing you this summer! All summer long we will be posting pics and videos of our shows. So visit frequently! So glad we found this website. Would love to see Larry perform!!!!! Has been many years!!! Just to let you know that your still the talk of the East Aurora American Legion Post 362 after your March 7th appearance. Can’t wait to have you back. From your friends at Post 362.
ok, Backbeat ’64, I am done with winter–even though it’s been fairly mild. Any chance that you will be posting your 2016 schedule soon? Sure hope so. What a terrific show last evening in Blasdell at the park! You were fabulous and I look forward to seeing you again soon. Back Beat performed at our home last weekend. Besides the exceptional Beatles music memories, Don, John, Tony, Larry, Joe, & Mike are the best people you’ll ever meet. Made our party a complete success. Friends forever. Thanks so much. It was a pleasure play your party. We couldn’t have ask for better hosts!!! I sure am missing you guys and your terrific music. I hope that all of you have a wonderful holiday and please post your 2017 schedule soon. Thank you Dru! We can’t wait to finalize our summer schedule and see all of our fans. Happy Spring Backbeat ’64 — We are all anxiously awaiting your 2017 schedule. Looking forward to seeing you soon. Thanks Dru! I just posted a few shows on the site. Hope to see you soon. ??????? were so looking forward to it. Thank you BackBeat ’64 for a fantastic evening of music and entertainment. So good to see all of you. Thank you Dru for supplying the jet sound in USSR!!! Happy winter Backbeat ’64. I am hoping that Don is back up on his feet and that you have a full schedule this year. I am looking forward to seeing all of you. Thank you Dru. Don is back and booking gigs for 2018. I will keep the site updated as they come in! Thanks for a terrific couple of weeks of the best music!!!! Looking forward to the fall schedule. So happy to see the new schedule. Can’t wait to see you guys!!! So excited to see your summer shows posted!!!! Looking forward to seeing all of you this summer!!! Thanks Dru, looking forward to seeing you too! Subscribe to the Backbeat '64 Newsletter and get up to date emails about the band and special insider info.